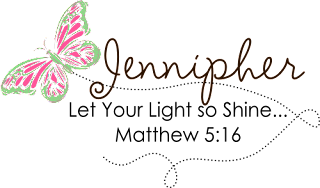 Paper Expressions by Jennipher: Clouds for the First Time! Clouds for the First Time! I've been seeing all these fund cards with clouds in the background and wondering "how on earth did they do that". Well, my fellow DT member and blogging friend Shannon was kind enough to share with me a tutorial on how she did hers. Thanks again, Shannon. This card is my first attempt at making clouds so please keep that in mind. It's also my first time working with "Courageous Carl"as well. "Courageous Carl" by Crissy Armstrong available at Whismy Stamps. "smile" sentiment from Verve. 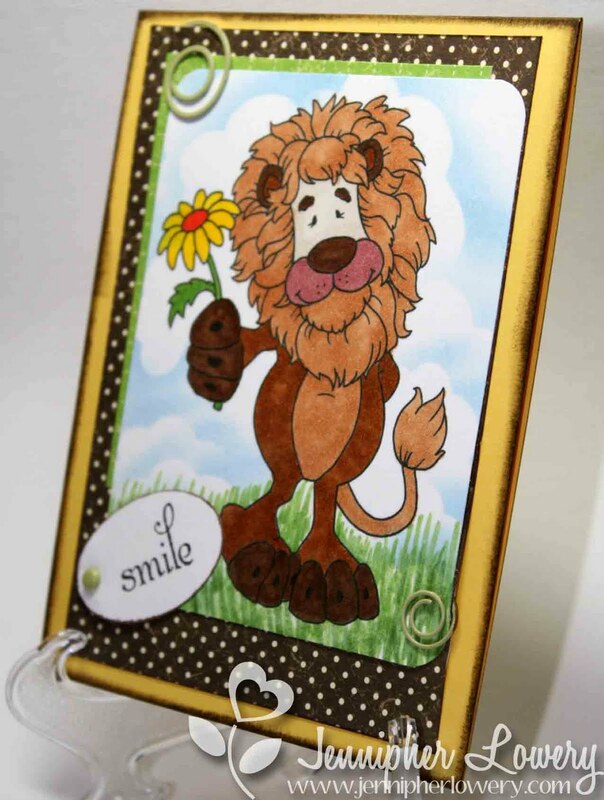 This card was inspired by the Craft Your Passion Challenge #66: Just For You- create a general card for anyone. I'm going to send this card to my niece. She's going through some growing pains with her family right now. You know that time in your life when you have graduated from high school so technically, you are an adult but, you live under your parent's roof and you have to abide by their rules? I remember it well and that's what she's going through at the moment. Sunday's With Crissy is having a Design Team Call! Crissy designed the "Courageous Carl" image I used on my card today. You can read all about the details and apply by clicking the link below. gorgeous clouds and that sweet lion makes me think of the wizard of oz! The clouds are spectacular! The coloring is wonderful. I like how the "L" in the sentiment is much higher and more dramatic than the other letters. Precious card and oh my goodness....those clouds are sensational!!! So pretty!! Love the fluffiness of them. Great job on the clouds and they look great with this little lion. Sweet card. Your clouds are perfect! Thanks for entering my DT call with Courageous Carl! Beautiful card. You did a fabulous job with the clouds. You did a great job on the clouds...and the rest of this super cute card too! Awesome clouds Jennipher and I love your adorable lion. Wonderful creation. CUTE! I think the clouds & grass look fabulous! Good luck with the DT call. Oh, Carl is just adorable! I think your clouds look wonderful (grass, too) and your card is just fabulous! Wow, first time...really??? That background looks professional! Your card is delightful and Carl is just adorable. Love your blog, it's such a happy place so I had to sign up to follow you!! Wonderful card, your clouds are fantastic. WOw your clouds are awesome... do you have a tutorial for this? Great card and I love Carl... TFS! great job on this wonderful card!...and the clouds are PERFECT! 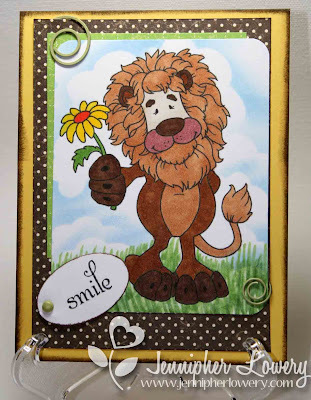 What a cute card and I just love the clouds and the lion!! Toooo cute!! Your clouds turned out fabulous and have me wishing I knew how to do that too! The lion is awesome, ROAR!! !